The iconic Washington wineries look to the future of our state’s wine industry and wines that give a nod to their roots. This is a year of milestones in Washington wine, and especially in Woodinville, the beating heart of west-side winemaking. Chateau Ste. Michelle, which essentially inaugurated Washington state as a serious winemaking region, is celebrating its 50th anniversary; DeLille Cellars, which helped kick off the boutique winery phenomenon in Woodinville that has yet to abate, is celebrating its 25th. Each winery is integral to the history of Washington wine; each well deserving of an anniversary toast. While Ste. Michelle has chosen 1967 as its starting point, the winery’s roots actually stretch all the way back to the repeal of Prohibition, in December 1933. Very soon thereafter, two wine companies were launched: Pomerelle and National Wine Company, with both focused on fruit wines (think blackberries and currants) in the early days. Those companies merged (in 1954) to become a winery called American Wine Growers and shifted their focus to vinifera (wine grapes). In 1967, American Wine Growers launched Ste. Michelle Vintners, but it wasn’t until the actual chateau was built in 1976 that the winery switched to its current moniker. Over the subsequent half-century, Chateau Ste. Michelle has grown in lockstep with the Washington wine industry as a whole. The number of wineries in Washington is creeping up close to 1,000, and the state boasts more than 50,000 acres under the vine. Meanwhile, Chateau Ste. Michelle has grown to become the second-largest premium American brand sold in the United States, trailing only California’s Kendall Jackson. But that growth didn’t happen overnight, and neither did the growth of the Woodinville wine scene. In fact, by 1992, 25 years after Ste. Michelle’s launch, there were a grand total of four wineries in Woodinville: Chateau Ste. Michelle, Columbia and two now-closed wineries, French Creek and Facelli. DeLille launched as winery number five in Woodinville, and is now the third-oldest operating winery in town. DeLille’s founding partners were father and son Charles and Greg Lill, wine broker Jay Soloff (who knew Greg Lil via the Rotary Club) and winemaker Chris Upchurch, a friend of Soloff’s and an acolyte of the legendary Master of Wine (and longtime Columbia winemaker) David Lake, who helped DeLille with vineyard connections in the early years. “The quantum leap was in the vineyards,” recounted Upchurch. Back in the ’90s, many of the vineyards were oriented north to south, not because that’s necessarily the best orientation for growing grapes, but because, says Upchurch “the roads went that way.” The team at DeLille analyzed everything in the vineyards; not just orientation, but grape clones, the aspects of vineyard slopes, spacing between vines—you name it. DeLille was also among the early pioneers for Bordeaux-style reds (blends of Cabernet Sauvignon, Merlot, Cabernet Franc, Malbec and Petit Verdot), now as common as roundabouts in Woodinville, but back then, they were rarities in a landscape dominated by varietal wines. Photograph by DeLille Cellars. Left to right: Tom Dugan, Sam Bronfman, Pat Lill Jorgenson, co-founder Jay Soloff, winemaker Jason Gorski, co-founder Greg Lill and executive winemaker Chris Upchurch. DeLille’s influence on Washington also stems from many of its assistant winemakers moving onto lead winemaker roles at other wineries. To name a few: Chris Peterson (Avennia), Ross Mickel (Ross Andrew), Lance Baer (Baer), Louis Skinner (Betz), Mike Macmorran (Mark Ryan), and Kit Singh (Lauren Ashton). Even Bob Betz made a couple of vintages for his eponymous winery at DeLille before moving to his own facility. And Betz is a veteran of Ste. Michelle, which has also yielded numerous lead winemakers: Mike Januik of Novelty Hill–Januik, Charlie Hoppes of Fidelitas, Ron Bunnell of Bunnell Family Cellar, Kay Simon of Chinook—the list goes on and on and on. Neither winery seems content to rest on its well-earned laurels, either. Chateau Ste. 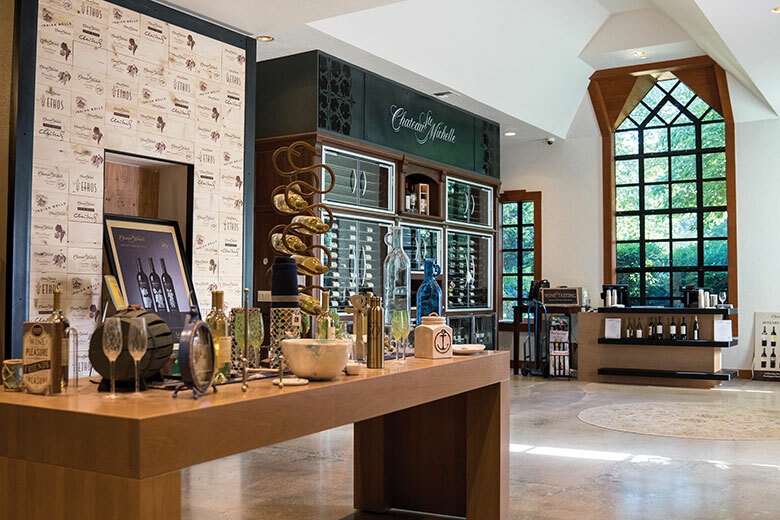 Michelle just completed a massive construction project that doubled the size of its old tasting room and added a series of VIP rooms, including one where guests can create their own blends and have them bottled. Its wines are already available in all 50 states and more than 100 countries, but the big upcoming push will be in Asia; especially Japan, Korea and China. Meanwhile, DeLille has been engaged in a four-year growth spurt, ever since a 2013 investment from private equity firm Bacchus Capital Management. D2, one of DeLille’s signature Bordeaux blends, for example, more than doubled in production from the 2012 vintage (5,500 cases) to the 2014 vintage (11,750 cases) and is poised to continue growing, just like these two Woodinville stalwarts, just like the Washington wine industry as a whole. We asked each winery to choose two wines to represent the past and two to represent the future. The older wines, except for one, are not for sale—the wineries only have enough bottles for special occasions—but our wine writer Paul Zitarelli was able to taste them and catch a glimpse into Washington’s wine history. Some of Chateau Ste. Michelle’s biggest points of pride are its partnership projects, including Eroica, which is a collaboration with Mosel (Germany) Riesling winemaker Ernst Loosen. German Riesling is known for its ability to evolve in profound directions with bottle age, and this vintage of Eroica, at nearly a decade past vintage, makes a case that Washington Riesling can do the same. Aromatically, this mixes tangerine, lime leaf and mineral with the smoky diesel note often associated with aged Riesling. This seems to be aging glacially, the fruit still very much primary (and just off-dry), the acidity still fresh and vibrant. Originally planted in 1972, Ste. Michelle’s estate vineyard doubled Washington’s entire wine grape acreage at the time it was planted. This Cabernet, more than two decades into its evolution now, pours ruby-garnet in the glass and offers a nose that wouldn’t be out of place in Bordeaux: cassis and cedar, mint and earthy barnyard. The palate remains fresh and vibrant, carrying waves of mint-tinged red fruit that fans out and coats the mouth. DeLille helped to pioneer not only Bordeaux-style reds in Washington, but also dry Bordeaux-style whites, which are blends of Semillon (in this case, 43 percent) and Sauvignon Blanc (57 percent). This pours into the glass deep gold, befitting its age, and offers a lovely nose of fig, date and golden plum fruit, complemented by savory maturing notes of hay and straw. Still very much alive, with a bright vein of acidity balancing rich, creamy fruit. Truly an outrageous, eye-opening showing for a white wine 16 years past vintage. A fine example of DeLille’s longtime focus on Red Mountain fruit, which comprises 72 percent of this wine, this Chaleur Estate is a blend of 66 percent Cabernet Sauvignon, 24 percent Merlot and 10 percent Cabernet Franc. It offers a beautiful mature nose: a mix of fresh and dried red fruits, earthy brewed coffee and a savory kick of soy sauce. The texture is rich and supple, any rough edges long ago sanded down by the power of bottle age. Chardonnay has been a growth focus area for the Chateau in recent years. Its Ethos Reserve is a barrel selection program, and in the case of this Chardonnay, it selected 90 barrels out of the 32,000 (!) Chardonnay barrels available to it. Dry, rich and supple, this Chardonnay seduces with its mix of peach and apple, smoke and flint. There are subtle, warming barrel tones of vanilla, and the overall package is beautifully balanced. pairs with: A Dungeness crab cake, heavy on the crab, light on the filler. Ste. Michelle’s most recent collaborative project is with Frenchmen Michel Gassier and Philippe Cambie, focusing on Rhône varieties. There is a tiny 1 percent Viognier co-ferment with the Syrah, and small (2–3 percent) splashes of Grenache and Mourvèdre in the blend. It pours inky purple-black into the glass, and kicks off with a wow nose: threads of woodsmoke wending through blueberry fruit, bacon fat, black olive tapenade and lifted violet florals. Polished, velvety and complex, this is a wine to bridge Old World and New World styles. pairs with: Braised lamb shanks over olive-studded rice. D2 is DeLille’s highest production wine and one of its finest. For the 2014, the blend is 58 percent Merlot, 36 percent Cabernet Sauvignon, 5 percent Cabernet Franc and 1 percent Petit Verdot. It comes from more than a dozen vineyards scattered across Washington, including luminaries such as Red Willow, Klipsun, Boushey, Harrison Hill and DeLille’s own estate site, Grand Ciel. Deep, intense black fruits (blackberries, black cherries) are complemented by threads of smoke, earth and cedar, all in an openly delicious, pleasurable package. pairs with: Seared duck breast, medium rare, with a cherry gastrique. Four Flags is a newer wine for DeLille that began its life as a wine-club-only wine. It is 100 percent Cabernet Sauvignon and comes from four vineyards on Red Mountain: Grand Ciel (42 percent), Upchurch (31 percent), Ciel du Cheval (19 percent) and Klipsun (8 percent). Aged for 20 months in French oak (75 percent new), this wine shows the open power and toothsome chew of good Red Mountain Cabernet, with robust tannins framing a core of black plum, cassis and star anise. pairs with: A garlic-studded standing prime rib roast.